Review this checklist before your workers begin their work. 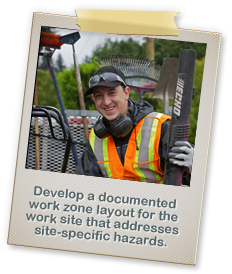 Do you have a documented work zone layout for the work site? Does the layout address site-specific hazards? Do you have the proper traffic control devices – cones, barriers, signs? Is all equipment in good condition? Do you have safe work procedures for roadside work? For working around mobile equipment and work vehicles? Do you have an emergency plan for the work site? Do all workers have proper high-visibility garments and other required personal protective equipment (PPE)? Have workers received a safety briefing? Hazards of the work site, including mobile equipment or work vehicles? Safe work procedures for roadside work? Safe procedures for working around mobile equipment and work vehicles? How to report near misses and other safety incidents? Have you identified a person responsible for the work zone set-up? Do they have the authority to take corrective action as required (i.e., to modify the work zone set-up to address on-site hazards)? Have you identified hazards and controlled risks associated with job activities, in addition to vehicle and traffic hazards? Do you have a plan to regularly inspect the work zone to ensure proper set-up? Are their vehicles set up with the signs, cones and other traffic control devices that they may need? Do they know how to set up a safe work zone; i.e., how to place traffic warning signs and other devices? Do they know how to identify and address vehicle and traffic hazards once they arrive at their work site?